From the South—Garden State Parkway North to Route 17 N – Travel approximately 10 miles – Take exit for West Ramapo Avenue, Mahwah. Proceed straight to stop sign. 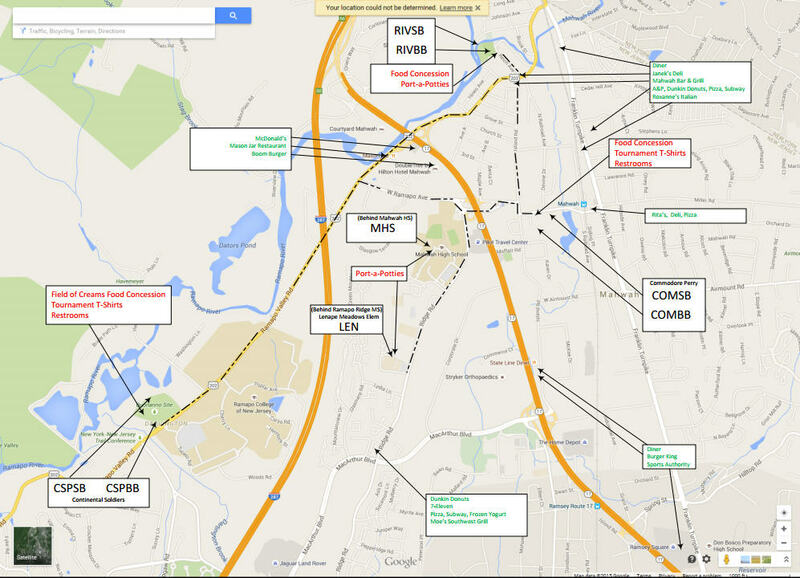 Take right onto Island Road and first left onto Ramapo Avenue to first right into parking lot for field. From the North—Interstate 287 to Route 17 S – Travel approximately 3/4 miles- Get off at West Ramapo Avenue, Mahwah (under overpass). Keep bearing to the right – going over Route 17. At stop sign, take right onto Island Road and first left onto Ramapo Avenue to first right into parking lot for field. From the South—Garden State Parkway to Route 17 N - Travel approximately 10 miles - Get off at West Ramapo Avenue, Mahwah - Pompton Lakes exit. Keep bearing to the right going over Route 17. Come to a stop sign, make a left (Ridge Road). As you're climbing the hill, Mahwah High School is to the right. Enter school and take first right and loop around to back of school to see field on your left. PLEASE NOTE: parking at the field is limited; parents please park in the lot in front of the school. From the North—Interstate 287 to Route 17 S – Travel approximately 3/4 miles - Get off at West Ramapo Avenue, Mahwah (under overpass). Come immediately to a stop sign (do not continue over Route 17) and turn left onto Ridge Road. As you're climbing the hill, Mahwah High School is to the right. Enter school and take first right and loop around to back of school to see field on your left. PLEASE NOTE: parking at the field is limited; parents please park in the lot in front of the school. From the North—Interstate 287 to Route 17 S – Travel approximately 3/4 miles - Get off at West Ramapo Avenue, Mahwah (under overpass). Come immediately to a stop sign (do not continue over Route 17) and turn left onto Ridge Road. Lenape Meadows is on the right past the High School and behind Ramapo Ridge School. Field is along driveway. From the South—Garden State Parkway to Route 17 N - Travel approximately 10 miles - Get off at West Ramapo Avenue, Mahwah - Pompton Lakes exit. Keep bearing to the right going over Route 17. Come to a stop sign, make a left (Ridge Road). Ramapo Ridge School is on the right past the High School. Parking is to the left of the school; the Ridge 1 field is located to the right of the school. From the North—Interstate 287 to Route 17 S – Travel approximately 3/4 miles - Get off at West Ramapo Avenue, Mahwah (under overpass). Come immediately to a stop sign (do not continue over Route 17) and turn left onto Ridge Road. Ramapo Ridge School is on the right past the High School. Parking is to the left of the school; the Ridge 1 field is located to the right of the school. From the South—Garden State Parkway to Route 17 N - Travel approximately 10 miles - Get off at West Ramapo Avenue, Mahwah - Pompton Lakes exit. Keep bearing to the right going over Route 17. Come to a stop sign, proceed straight into Inserra parking lot (brown brick building) and park to the right. Walk around fence on the right of parking lot and head up the hill to field. From the North—Interstate 287 to Route 17 S – Travel approximately 3/4 miles - Get off at West Ramapo Avenue, Mahwah (under overpass). Come straight and immediately to a stop sign (do not continue over Route 17) and turn right and then quick left into Inserra parking lot (brown brick building) and park to the right. Walk around fence on the right of parking lot and head up the hill to field. Take 17 North and exit onto Route 202 (Suffern/Morristown). Stay right off the ramp onto Route 202 North. Make left onto Reich Avenue, the street just past Mahwah Bar and Grill on right, and directly past Janek's Meat Market on the left. Follow Reich Avenue to Riverside Park. If you miss this turn, take the next left on Brakeshoe Place and follow this to Riverside Park. If you park facing the fields, Riverside No. 1 is on the left and Riverside No. 2 is on the right. From the South—Garden State Parkway to Route 17 N – Travel approximately 11 miles – Get off at the Route 202 exit. At the end of the exit ramp make left turn (202 South). Continue on Route 202; see entrance to Ramapo College on left, fields complex on right. PLEASE NOTE: you must park in the lot as you first pull in; not in the grass by the field. From the North—Interstate 287 to Route 17 S – Travel approximately 1/2 mile – Get off at the Route 202 exit. At the end of the exit ramp make left turn (202 South). Continue on Route 202; see entrance to Ramapo College on left, fields complex on right. PLEASE NOTE: you must park in the lot as you first pull in; not in the grass by the field. From the South—Garden State Parkway to Route 17 N – Travel approximately 11 miles – Get off at the Route 202 exit. At the end of the exit ramp make left turn (202 South). Continue on Route 202. Make the first left after Continental Soldiers Park onto Darlington Road (about 0.1 miles), and then the first right onto Campgaw Road (about 0.2 miles). Follow Campgaw about 2 miles (go over Route 287 and past Darlington Golf Course). Make a left onto Youngs Road and then the second right onto Chapel Road. The parking lot is on left, next to the field. From the North—Interstate 287 to Route 17 S – Travel approximately 1/2 mile – Get off at the Route 202 exit. At the end of the exit ramp make left turn (202 South). Continue on Route 202. Make the first left after Continental Soldiers Park onto Darlington Road (about 0.1 miles), and then the first right onto Campgaw Road (about 0.2 miles). Follow Campgaw about 2 miles (go over Route 287 and past Darlington Golf Course). Make a left onto Youngs Road and then the second right onto Chapel Road. The parking lot is on left, next to the field. High School to Continental/ RC—Take a left out of the HS heading north on Ridge road. At end of road, take a left on to West Ramapo Rd. At end of road, make a left heading south on to Ramapo Valley Road. Entrance to Ramapo College will come up on right after main college sign. Entrance to Continental comes up on right at next light. Continental/ RC to High School—Take a left out of Continental/ RC on to Ramapo Valley Road heading north. Turn right on to West Ramapo Road (Holy Cross Church on corner). Before Route 17, turn right on to Ridge road. High School comes up on the right. Commodore Perry to High School—Exit complex by basketball courts and taking right on Island road. Take immediate left on to East Ramapo road. Take immediated left on to ramp to bridge over route 17. At end, turn left on to Ridge road. High School comes up on the right. High School to Commodore Perry—Take a left out of the HS heading north on Ridge road. Make a right at overpass onto Ramapo Road. Continue on to Ramapo road. At end, turn right on to Island road. Make immediate left on to East Ramapo road. Park is immediately on the right. Continental to RC—Take a left out of complex. Entrance to Ramapo College comes up quickly on left, fields complex on right. Continental/ RC to Commodore Perry—Take a left out of complex or College. Take right on to West Ramapo Ave. Make right before Route 18, continue over overpass and merge back onto West Ramapo. At stop sign, take right onto Island Road and first left onto Ramapo Avenue to first right into parking lot for field. Commodore Perry to Continental / RC—exit at Island road. Take right on Island road and quick left onto West Ramapo Ave. Take left before route 18, continue over overpass, and make right at stop sign. Make a left at next stop sign to continue on West Ramapo Ave. At stop sign, make a left onto routh 202. Continue on Route 202, past the 1st traffic light at the entrance to Ramapo College. RC fields are on right. For CSP, go straight and turn right at the 2nd light into the Park. Commodore Perry to Riverside—exit at Island road. Take right on Island road and proceed to end of the road. Make a right on 202 and a quick left onto Reich Ave. Fields are at the end of the road on the left. Continental/ RC to Riverside—Take a left out of complex or College onto 202. Take left onto Reich Ave. Fields are at the end of the road on the left. Continental to Fardale—Take a right out of complex amd make the first left onto Darlington Road (about 0.1 miles), and then the first right onto Campgaw Road (about 0.2 miles). Follow Campgaw about 2 miles (go over Route 287 and past Darlington Golf Course). Make a left onto Youngs Road and then the second right onto Chapel Road. The parking lot is on left, next to the field.. Entrance to Ramapo College comes up quickly on left, fields complex on right.